Michael Tippett called T.S. Eliot his spiritual and artistic mentor, and their numerous discussions in the 1930s proved a lasting influence on the composer’s beliefs about the coming-together of words and music. 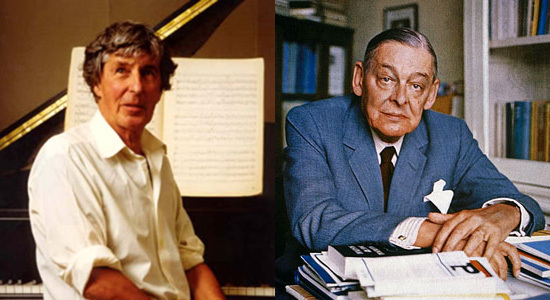 Tippett quoted from and alluded to the work of Eliot not only in his early pieces, as has previously been noted, but in much later compositions such as The ice break, The mask of time, and Byzantium. Eliot’s essay The three voices of poetry examines the number of voices in which the I of a poem can speak, freed from the specificities of prose, and Tippett, influenced by Eliot, harnessed the form of oratorio, freed from the specificities of opera, to allow it to speak in many voices. This according to “Tippett and Eliot” by Oliver Soden (Tempo LXVII/266 [October 2013] pp. 28–53). Today is Tippett’s 110th birthday! Below, the opening movements of A child of our time, another of Tippett’s works that was influenced by Eliot.